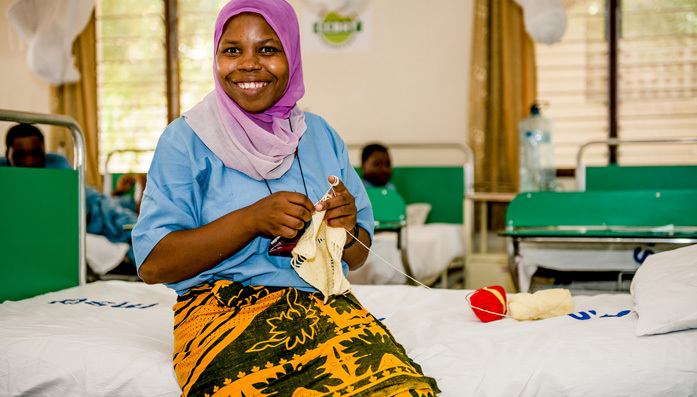 23 year old Mariam suffered a traumatic labour after her first pregnancy. The baby died and she was left doubly incontinent due to obstetric fistula. “I suddenly felt so lonely, excluded and useless. Not only did I lose my child. I just wasn’t the person I used to be anymore. I smelt badly, I couldn’t hold my urine and my bowels; I was scared of other people. I was so ashamed. And then – at home – I realized that I was dripping. It just ran down my legs. Permanently. It was really bad. I felt so ashamed. I smelt bad. I just stayed at home. I didn’t want to see anybody. I didn’t want the neighbours to see me like that and give them a reason to talk badly about me. Only my mother in law knew about my condition. She cared for me, prepared food for me, supported me when I walked. I was desperate. I asked myself if I would be like that for the rest of my life, and if my husband could still love me or if he would leave me. I was very confused. I told no-one in the village of my situation. I kept hidden from friends and neighbours. I constantly had to clean my clothes and myself. People kept asking me, “What are you doing? Why are you washing your clothes again?” I tried to keep out of their way. I was too ashamed and scared that they might get to know the truth and that they would gossip about me… They probably knew all along anyway. Nobody came close to me. I smelt bad in any case. I felt so alone. I am so happy and grateful to be here. Only here at CBM's partner hospital I realised that I am not alone, that there are many women who have the same problem. Here I could talk about my feelings and my experiences. We eat together and do handcraft together, we knit. I have also learned a lot about maternal health here. When I go back to the village, I will not hide anymore. I will tell the people that I’m overjoyed to be cured. And I will tell the other women: If you have the same problem, don’t hide! There are doctors who helped me, too, and changed my life."